It was a blessing to win 15 year old Courtney Snead to Christ. She subsequently went forward an altar call. Her faithfulness and zeal to invite her friends confirm a true conversion. There have been 47 saved as fruit of Pastors Sábas Martínez and his nephew, Paulino Martínez preaching in different communities. In Peloncito they hold services in the open because rarely are rental facilities available in rural areas. Pray God provides the finances for these new believers to have a place of worship. Shortly after relocating to North Carolina in 2012, I sought to begin a church in either of two cities, but in neither did the door open. The Spirit always works on his timetable, not ours! 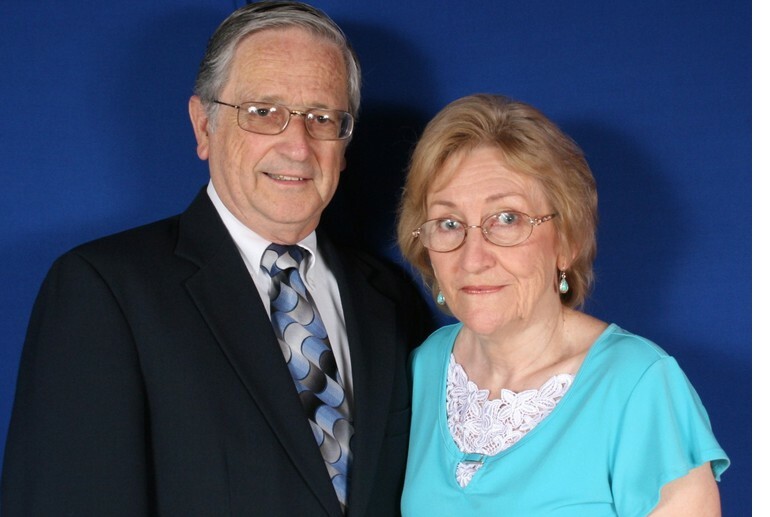 At our pastor’s request we will initiate La Iglesia Bautista El Resplandor (the light shineth in darkness, John 1:5) on February 3rd, three days before my 77th birthday (“later rains” harvest). The services will be held in our home church´s facilities. Satanically provoked concerns that I experienced assure me that many will be reached and nurtured. Our first church begun in 1971 took ten years to nationalize; developing the next two simultaneously took 18 and 9 months respectively. Those churches built on the Rock still lift up Jesus in their communities. 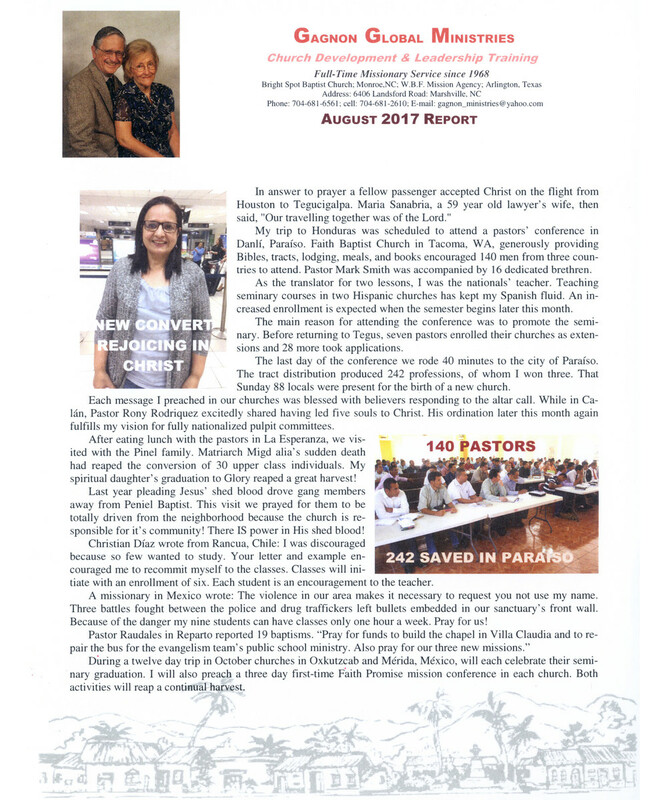 The fourth church we are establishing, the 57th under our ministry, will likewise continue long into the future under a Hispanic pastor. Of seven seminary graduates in Merida, two have become pastors. There were thirty graduates in Oxcutzcab, both in Mexico. Jose Huerta in Teques, Venezuela wrote asking help to start classes. 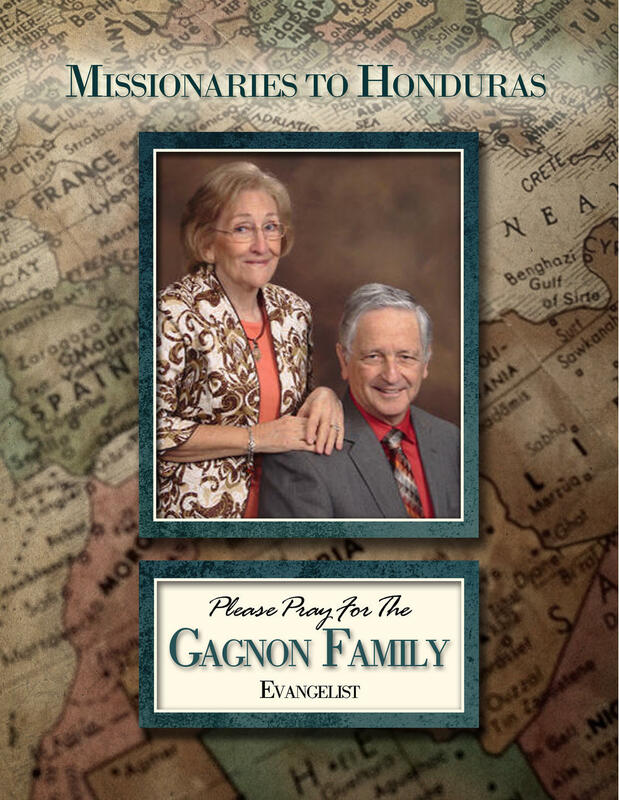 On August 25th Mary and I celebrate 50 years as missionaries. We begin Iglesia Bautista La Gracia on June 20th, 1971. The following February a satanic emissary’s direct attack caused the accidental death of a young child, my incarceration for 26 hours, and Mary spending her first night alone in a foreign country with two small children, plus having to achieve my release. Read our book that tell how God brings victories in spite of multiple adversities. Honduras’ 2.7 million has grown to over nine million. The 40 congregations developed through our ministries reach some of them. Too few laborers; too many lost souls! The work on Villa Claudia’s chapel and Sunday school rooms was made possible thanks to a $13,000 offering from our home church. Of the average attendance of 30, 20 are children. There have been 3 conversions. In rural Agalteca 22 adults and 40 children attend regularly; one soul was recently saved. The architect, a member of our first church, is drawing the plans and cost for a building. Trusting the Lord by faith our home church will underwrite this project also. Only basic structures are financed; they slowly add the finishing touches. The congregation in Payaguagre also needs a permanent facility. The attendance averages 49; 14 children were saved in D.V.B.S. When finished, these chapels will bring the number that your generous support has enabled us to build to 21. 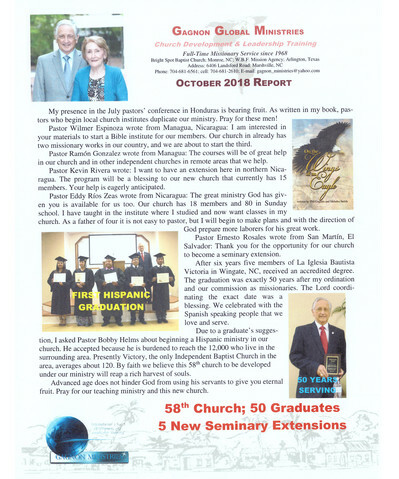 Victor Cu Panti, pastor of the Tabernáculo Bautista in Hopelchen, Mexico, called me excited about three men receiving an Associate of Bible Studies degree. Graduates and students strengthen their churches’ ministries; some begin churches. Our Seminary extensions continue to provide trained laborers for the Lord’s vineyard. Our daughter, Tanya (and her parents!) is excited because her son, Wayne and his wife, Nikki, were transferred from Italy to Fort Bragg, a two hour drive from us. Grandson Billy will visit from Hawaii for ten days with his fiancée, Kaylynn Huttinger. Great grandson, Hampton Smith, who will be married on July 8th, is assigned to an Air Force base in New Mexico. Pray for our military, law officers, and emergency service personnel. The book can also be ordered from me, saving the cost of shipping. 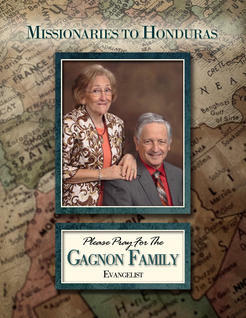 Pray God uses it for the growth of Christ’s kingdom worldwide, and for my burden to translate it to Spanish. 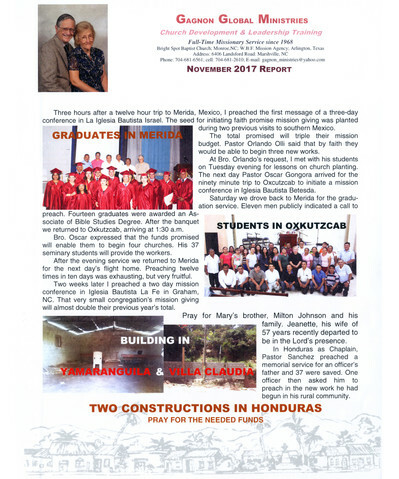 The seminary graduates from Iglesia Bautista Israel in Mérida, México, are beginning new missions in Izamal, Tixkokob, y Concal. Other men are serving two other established churches. The funds being received due to my visit that initiated faith promise last November helps provide the needed finances. The total number of churches begun through our ministry has risen to 56. Eight students studying in Tigo María, Perú, were honored for having completed the first level of their seminary studies. Rodolfo Vargas shared that each student is active in the church and mission. A special emphasis in our home church resulted in souls accepting Christ every Sunday for nine weeks, bringing the yearly total to over 50. Pastor Bobby Helms works a full-time job, plus carries the burden of a son with cerebral palsy and an autistic daughter, yet the small congregation has grown to 220 in its ten year existence. Easter Sunday 265 attended. The trip to the state of Yucatan was blessed of the Lord. During the 10 day visit I preached 12 times. The conference in Merida from Friday to Sunday morning ended with a faith promise commitment of $9,015.00 triples their mission giving of the previous 12 months. The minimum wage is $10.00/day. 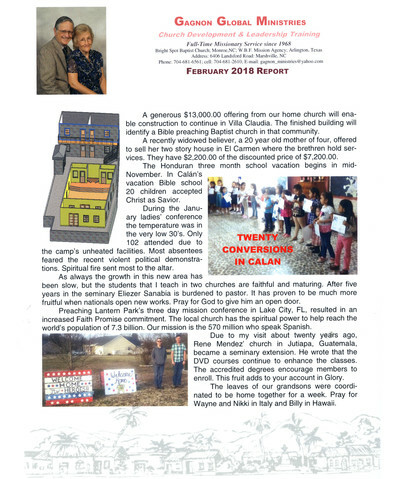 This will enable Pastor Olli to reach hisgoal of 3 new churches. On Wednesday we traveled 90 minutes to Oxcutzcab where I preached each night, explaining faith promise giving. 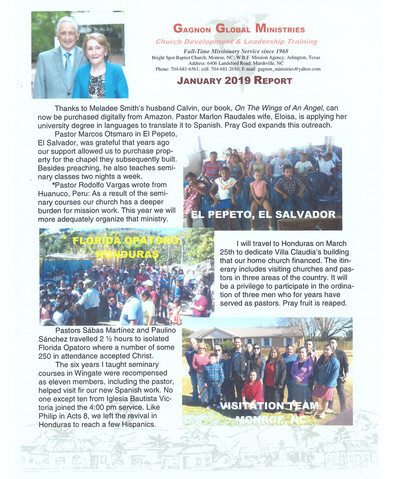 The conference introduced faith promised giving to both Iglesia Bautista Israel and I.B. Betesda. Saturday morning we drove back to Merida for the graduation service. During the invitation 11 men went forward to testify of their call to preach, 7 were among the 14 graduates. I was interviewed for a news broadcast that was aired in 4 southern Mexican states. They were very supportive of the church's training ministry. We left after a meal in a upscale hotel, arriving back in Oxcutzcab at 2:30 Sunday morning. In spite of being exhausted the Spirit's anointing enabled me to preach over an hour (the pastor's S.S. lesson lasts 2 hours). The faith promise that concluded the service was just under $10,500.00. Minimum wage in that farming city of 30,000 is $5.00/day. Pastor Oscar Tamaya has a goal of beginning 4 new churches. He will have the support of the 36 students in his seminary classes. The 11 called to preach, the new students in both churches, and the initiation of yearly faith promise mission conferences will reach far into the future. When the 7 projected missions become it will bring the number of churches begun as a result of our ministry to 57. Praise the Lord for fruit to your account in Glory. In answer to prayer a fellow passenger accepted Christ on the flight from Houston to Tegucigalpa. Maria Sanabria, a 59 year old lawyer’s wife, then said, "Our travelling together was of the Lord." My trip to Honduras was scheduled to attend a pastors’ conference in Danlí, Paraíso. Faith Baptist Church in Tacoma, WA, generously providing Bibles, tracts, lodging, meals, and books encouraged 140 men from three countries to attend. Pastor Mark Smith was accompanied by 16 dedicated brethren. As the translator for two lessons, I was the nationals’ teacher. Teaching seminary courses in two Hispanic churches has kept my Spanish fluid. An increased enrollment is expected when the semester begins later this month. The main reason for attending the conference was to promote the seminary. Before returning to Tegus, seven pastors enrolled their churches as extensions and 28 more took applications. The last day of the conference we rode 40 minutes to the city of Paraíso. The tract distribution produced 242 professions, of whom I won three. That Sunday 88 locals were present for the birth of a new church. Each message I preached in our churches was blessed with believers responding to the altar call. While in Calán, Pastor Rony Rodriquez excitedly shared having led five souls to Christ. His ordination later this month again fulfills my vision for fully nationalized pulpit committees. After eating lunch with the pastors in La Esperanza, we visited with the Pinel family. Matriarch Migd alia’s sudden death had reaped the conversion of 30 upper class individuals. My spiritual daughter’s graduation to Glory reaped a great harvest! Last year pleading Jesus’ shed blood drove gang members away from Peniel Baptist. This visit we prayed for them to be totally driven from the neighborhood because the church is responsible for it’s community! There IS power in His shed blood! Christian Díaz wrote from Rancua, Chile: I was discouraged because so few wanted to study. Your letter and example encouraged me to recommit myself to the classes. Classes will initiate with an enrollment of six. Each student is an encouragement to the teacher. A missionary in Mexico wrote: The violence in our area makes it necessary to request you not use my name. Three battles fought between the police and drug traffickers left bullets embedded in our sanctuary’s front wall. Because of the danger my nine students can have classes only one hour a week. Pray for us! 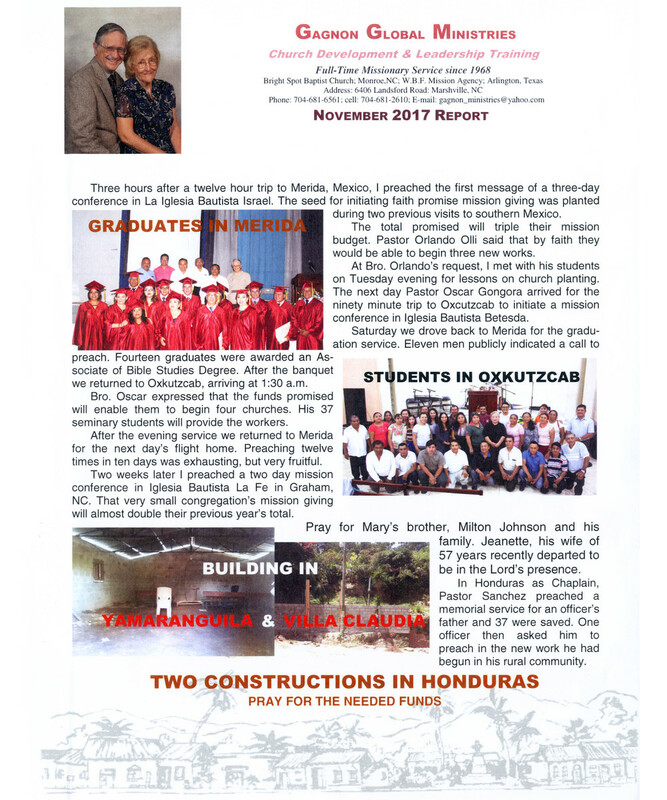 During a twelve day trip in October churches in Oxkutzcab and Mérida, México, will each celebrate their seminary graduation. I will also preach a three day first-time Faith Promise mission conference in each church. Both activities will reap a continual harvest.